In the rich history of Hollywood hypocrisy, there are few examples more striking than comedian Samantha Bee receiving an award for defending women from sexual harassment just one day after she called Ivanka Trump a “c*nt” and suggested she seduce her father to change his immigration policies. Bee apologized earlier in the day, but as she accepted her award Thursday from the Television Academy, she actually praised herself for her idealism. In other words, it is Bee’s critics who ought to feel shame. Bee apologized, but she is not really sorry for degrading a woman. She is proud, because it was for a higher cause. And Hollywood is proud of her, too, even though what Bee did to Ivanka Trump is exactly the sort of behavior that the #metoo movement is supposedly trying to stop. Bee denigrated and sexualized Ms. Trump, using her femininity as a way to humiliate and bully her. There are men in Hollywood who have been excommunicated over the past few months for doing that to female colleagues and employees, but Bee was told she should have gone even further. All of this occurred literally hours after Roseanne Barr lost her show, and likely her career, for a racist remark that was made in jest and for which she apologized contritely, telling friends and fans not to defend what she had done. The double standard is clear: if you are on the left, you can get away with almost anything — and if you are on the right, you can be abused by everyone. The #metoo movement does not apply to conservative women: they are not, in fact, to be considered women. Palestinian-American Muslim radical Linda Sarsour, co-organizer of the anti-Trump Women’s March — which was behind the school walkouts for gun control earlier this year — said as much when she tweeted about female critics of radical Islam several years ago: “I wish I could take their vaginas away – they don’t deserve to be women.” She referred to Ayaan Hirsi Ali — a woman forced to endure genital mutilation. Bee said at the Television Academy awards that she — and her staff, and her network, who presumably reviewed her monologue before she delivered it — had simply been carried away by righteous anger at “the inhumanities of this world,” including the policy of separating children from their parents when they enter the country illegally. But the policy was not started by Donald Trump, and it was introduced, in part, to protect migrant children from trafficking. Many on the left were forced to eat crow this week when it turned out that a photograph of supposedly inhumane treatment of these children had been taken in 2014, under Barack Obama. Never mind, they said — the policy is still wrong, and the government has “lost” nearly 1,500 of these children. Except that turns out not to be true, either. And when conservatives raised concerns about migrant children in 2014, the left actually defended their detention. Samantha Bee and the impassioned staff of Full Frontal, and networks standing behind her — Time Warner and TBS — had nothing to say about the problem them. They are not overcome by righteous indignation. They are blinded by hatred — so much so that they cannot even see they are throwing away what they say they believe. They are no longer #metoo heroes, but fraudulent feminists rewarding each other for abusing the right kind of women. Their hypocrisy is outrageous, but it is also self-defeating. They have reminded millions of ordinary Americans, in a crucial midterm election year, why they voted for Donald Trump in the first place — namely, to push back against the elites in Hollywood and Washington who despise them. When Roseanne posted her racist tweet, conservatives had no problem condemning her, even as they mourned the destruction of her show and the movement behind it. It was not only wrong, but politically stupid. 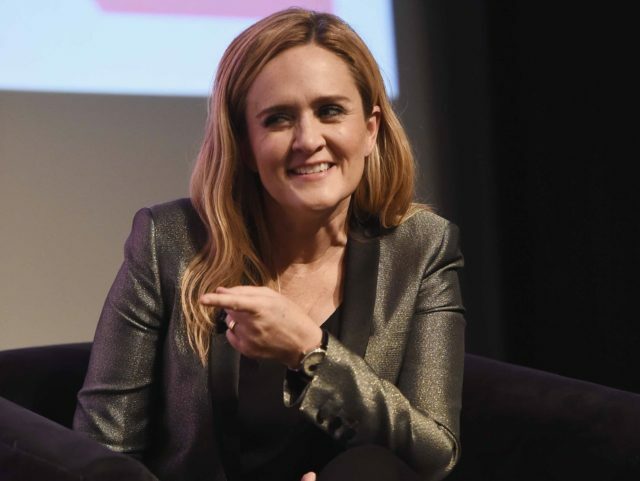 For some reason, Hollywood cannot even acknowledge that applauding Samantha Bee is a massive tactical mistake that could motivate conservative voters to keep Congress in Republican hands and forestall the policy changes liberals say they want. That is how lost they are in their own nightmare. One would almost feel sympathy for them — if they weren’t doing their best to force everyone else to share their misery.